After testing my DNA with FamilyTreeDNA, I uploaded my data on MyHeritage to find new matches. Almost all my ancestors were French, so I primarily looked for matches who also had French ancestors. Among them, I discovered a match from the US, Joy, whose great-grandfather was born in France. All she knew about him was that his name was Albert Hauzalot and that he was born somewhere in France in 1852, but nothing more. Joy and I share only a small DNA segment of 13 cM. This is not much, but it means that we probably share a common ancestor at some point. And even if it might not be possible to find a paper trail to this ancestor, we should be able to identify a common place of origin between her ancestors and mine (more precise than just France). I looked through Geneanet and Filae (the 2 most comprehensive French genealogy databases), to find men born in France around 1852 who had a name sounding like Albert Hauzalot. The name Hauzalot might indeed sound French but it actually doesn’t exist in France. His proper name was likely a name with similar consonants but other vowels. finally, on some records the surname was spelled Houzlow which makes it sound almost exactly like Houzelot in French. Therefore, I carried out some research to find his ancestors and see if we could be related. I soon discovered that Jules Albert Houzelot’s maternal grandmother was born in Gironville-sous-les-Côtes, a village where many of my ancestors were born. I focused on her line and quickly discovered a couple of common ancestors: François Formel and Anne Defoug, who lived around the beginning of the 18th century. 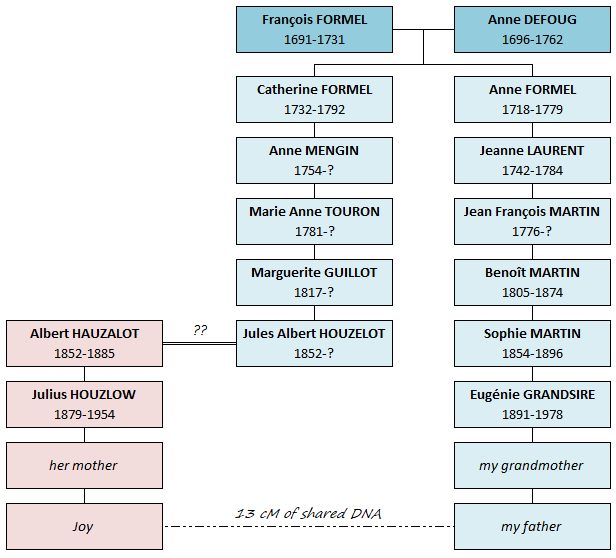 They were my 7th great-grandparents and Jules Albert Houzelot’s 3rd great-grandparents. This proved that Jules Albert Houzelot and I were related. And it then seemed very likely that Albert Hauzalot and Jules Albert Houzelot were one and the same. But I wanted to find more proof. Did Jules Albert Houzelot leave for the United States? To find out more, I went to the Archives in Bar-le-Duc and looked through 19th century passport applications. 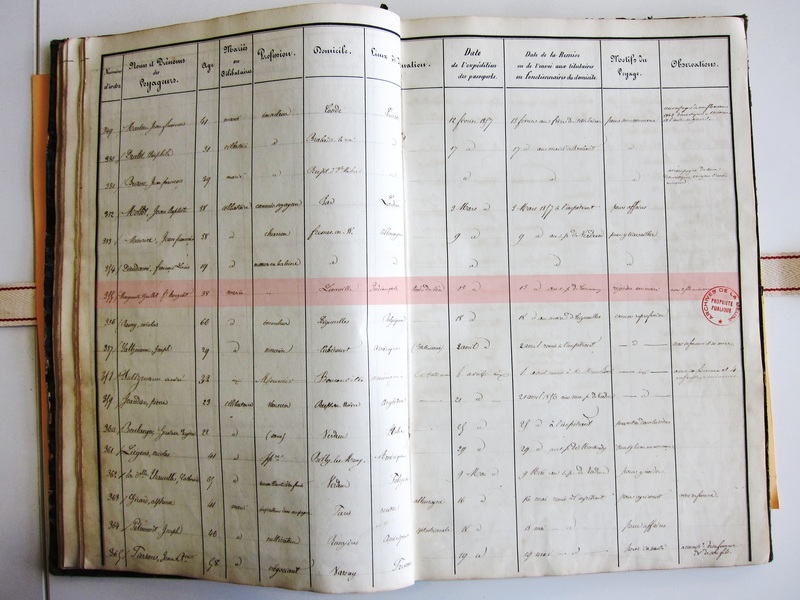 There, I looked at records of departures starting in 1852 (Jules Albert Houzelot’s date of birth). At the bottom of a page, I finally discovered the name Houzelot. The record wasn’t for Jules Albert but for his father Pierre Houzelot. Pierre Houzelot applied for a passport in March 1856 to go work in the United States. The record also stated that he was planning on staying there for good. However, this passport application did not mention his wife and their two sons. A few pages later, I found them: his wife, Marguerite Guillot, applied for a passport in March 1857, a year after her husband. The application stated that she was going to join her husband in Indianapolis and that she was leaving with their two sons. At this point, there was no doubt left: Joy’s great-grandfather was indeed Jules Albert Houzelot. This research confirms that Joy and I are indeed related through DNA and on paper. And we now know that our shared segment of DNA probably comes from our ancestors from Lorraine. However, we cannot be certain that this segment comes from the common ancestors that I identified. It could equally come from other common ancestors that we have yet to discover. In the end, thanks to this small segment of DNA, we uncovered not only the identities of Joy’s French ancestors, but also the circumstances under which they arrived in the United States. I have been told that DNA testing in France is illegal. I would imagine this is true as the privacy laws in France are famously strict. It is indeed illegal for French companies to sell DNA tests. It is also officially illegal for people to have their DNA tested except for medical or law purposes. But it doesn’t stop people from purchasing DNA tests from US-based companies (except from Ancestry which doesn’t ship to France). It also didn’t stop companies like MyHeritage from advertising their DNA tests on national television. However, talks are in progress to change the law and hopefully these tests will be legal soon.